Interpolator type (default is cardinal spline). Can be 'linear', 'cspline' or 'lagrange'. This function will create an interpolator object, that can be used either on fixed interpolation points (then use the interpolator with the resample function) or inside a dynamic clock recovery process (use with clock_rec_init function). Cardinal spline (type = 'cspline') : Piecewise third degree polynomial between each pair of known values. The polynomials computed here are Catmull-Rom cardinal splines (equivalent to Lagrange of degree 3). 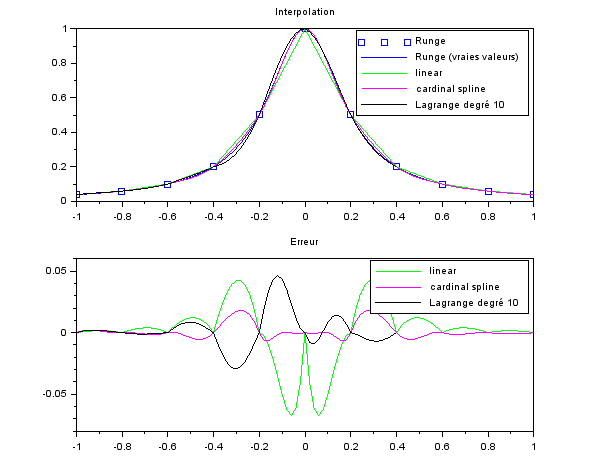 Lagrange (type = 'lagrange') : Piecewise polynomial interpolation (the degree d is configurable) between each pair of known values. Each polynomial is computed according to the d+1 neareast known values. 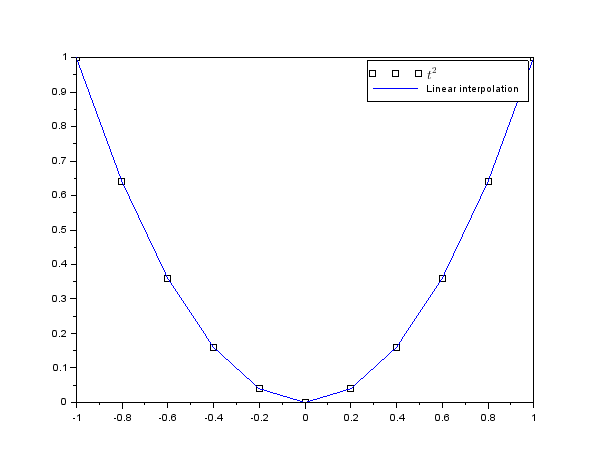 In this example, we use piecewise linear interpolation, with fixed interpolation points. itrp.nspl: Number of input sample needed to compute one output sample. For example, for the piecewise linear interpolator, it is 2.
itrp.fun: Interpolating function, which prototype should be: y = itrp_fun(x,mu,itrp), where x are nspl input samples, mu is the fractionnal delay, itrp the interpolator object, and y the computed output sample.